The terms interpreter and translator are often used interchangeably. It is thereby wrongly assumed that they are one and the same profession. There is, however, a clear difference between translating and interpreting. A translator translates the written word and an interpreter the spoken word. All the interpreters used by the Raccourci translation agency must be fluent in both languages and must have comprehensive cultural knowledge of both languages and the terminology specific to the relevant sector. Furthermore, we require that all our interpreters demonstrate their professional qualifications as an interpreter and provide references. Our management team always checks this information so we can guarantee the quality of our services. Raccourci provides professional interpreters with the right expertise to support your business meetings, product presentations or congresses. Our interpreters can assist you in communicating directly with your foreign clients and contacts. With their knowledge of your professional jargon, and thanks to their professional skills, you are guaranteed to be properly understood during your meetings, product presentations, conferences and congresses. Raccourci can provide you with experienced sworn interpreters or court interpreters who are competent in legal terminology. Our clients include law firms, notaries, banks, businesses and government bodies. The Sworn Court Interpreters and Translators Act (Wbtv) entered into force on 1 January 2009. Since that date sworn interpretations can only be carried out by interpreters registered in the Register of Sworn Interpreters and Translators (Rbtv). These interpreters have sworn an oath before the court and must meet numerous quality requirements. A professional interpreter is essential, but if he or she is incomprehensible then you will get nowhere, we therefore also supply the necessary technical equipment. As every client has their own requirements, we adapt our interpreting solutions to suit the needs for your specific project. 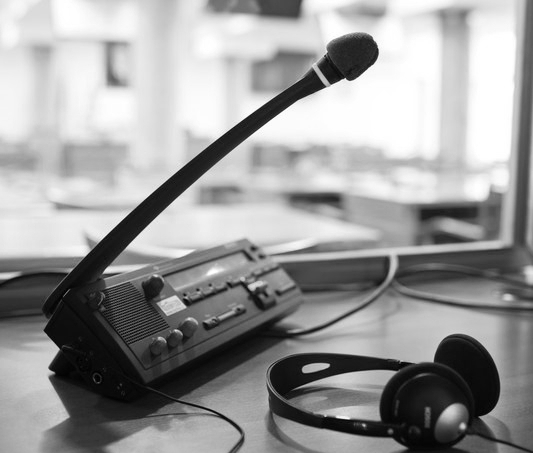 Besides expert interpreters, we provide the latest equipment, including headphones and microphones, as well as a skilled technician who will support the interpreter during the entire event. Raccourci translation agency offers a total solution for your interpreting needs. Ask about our interesting arrangements. We are specialised in French, German, English, Italian, Spanish, Portuguese, Hungarian and Dutch, and we can mediate should you require another language. Our rates start from €85 per hour. Simultaneous interpretation is when an interpreter translates the speaker’s words to the audience or discussion partner’s language in real time. Those present listen to the language of their choice through headphones that are connected to wireless receivers with multiple channels. 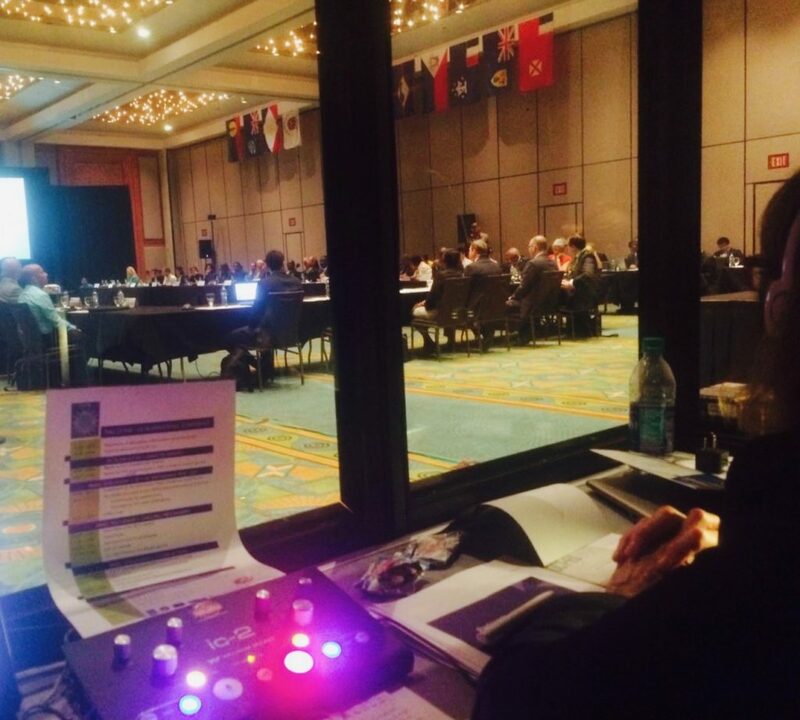 During simultaneous interpretation, the interpreters work in teams of at least two people. High levels of concentration are required for simultaneous interpretation so the interpreters work for approximately twenty to thirty minutes before the other takes over. While one interpreter is translating, the other listens in on the discussion so that he or she can support their colleague if needed. Simultaneous interpretation is highly intensive. It is often used during international business meetings, conferences, media broadcasts and bi- or multi-language events. These events generally require special equipment, such as headphones and an interpreter’s cabin and the presence of a technician to install and check all the equipment. During consecutive interpretation the interpreter functions as a mediator between two speakers. After two or three sentences, the speaker pauses to give the interpreter time to relay the comments in the discussion partner’s language. Consecutive interpretation is generally used during court cases, for witness statements, business meetings and negotiations, medical consultations, tours, informal meetings and social events. Whispered interpretation (also known as chuchotage) is almost identical to simultaneous interpretation, the only difference is that no microphones or soundproof cabins are used during whispered interpretation. The interpreter stands or sits next to the (small) audience and simultaneously translates the spoken words in a soft spoken voice. Whispered interpretations are often used in situations where the majority of a group speaks one language and a small proportion of the group does not, for example with foreign guests on a talk show. The technique of summary interpretation could be preferable in situations when a lot is said in a short period and where there is no additional time available for the interpreter to speak. Consider, for example, when translating a plea or claim during a court case. Interpretation services in English-French for the OCT-EU conference on Aruba about sustainable energy, climate change and Brexit. From 22 February to 24 February 2017, the 15 th OCT-EU conference on Aruba was held on various pressing topics. Sustainable energy, dealing with the risks of climate change, and rather importantly, the relations among the countries after Brexit were main topics.